On the eve of the meeting, two Chilean bishops held a press conference in Rome. They are Bishop Fernando Ramos, Auxiliary Bishop of Santiago and General Secretary of the Chilean Episcopal Conference, and Bishop Juan Ignacio González of San Bernardo. Archbishop Ramos recalled Pope Francis’ letter of April 8th with which he summoned the bishops to the Vatican. He explained how the Bishops have come specifically: “To receive the conclusions of the report by Archbishop Scicluna following his visit to Chile, and also to discern short, medium and long term measures to restore communion and justice”. These, according to the General Secretary of the Bishops’ Conference were “the two great themes to which the Holy Father invited us with his letter". Speaking at the press conference in Rome, Archbishop Ramos said the content of the meetings with the Pope would include: “The issues of abuse of power, abuse of conscience, and sexual abuse, that have occurred in recent decades in the Chilean Church, as well as the mechanisms that led, in some cases, to concealment and serious omissions against the victims. A second point is to share the conclusions the Holy Father drew from Archbishop Scicluna’s report. And a third point is the Pope's invitation to make a long synodal process of discernment to understand the responsibilities of each and every one regarding these terrible wounds of abuse, and to seek necessary changes so that they are not repeated". Archbishop Ramos spoke of the Bishops’ feeling of “pain and shame”. “Pain”, he said, “because unfortunately there are victims: there are people who are victims of abuse and this causes us profound pain. And shame, because these abuses occurred in Church environments which is precisely where this type of abuse should never occur". Archbishop Ramos continued: "We must ask forgiveness 70 times 7. I think it is a very important moral imperative for us. The important thing is that the request for forgiveness is truly reparatory". He concluded: "In all humility we will listen to what the Pope will tell us"; this is "a very important moment" for the renewal of the Chilean Church. When it announced the meeting with the Chilean bishops, in a communiqué on May 12th, the Vatican Press Office explained that "it is fundamental to restore trust in the Church through good Pastors who witness with their lives that they have heard the voice of the Good Shepherd, and who know how to accompany the suffering of the victims, and work in a determined and tireless way in the prevention of abuse. 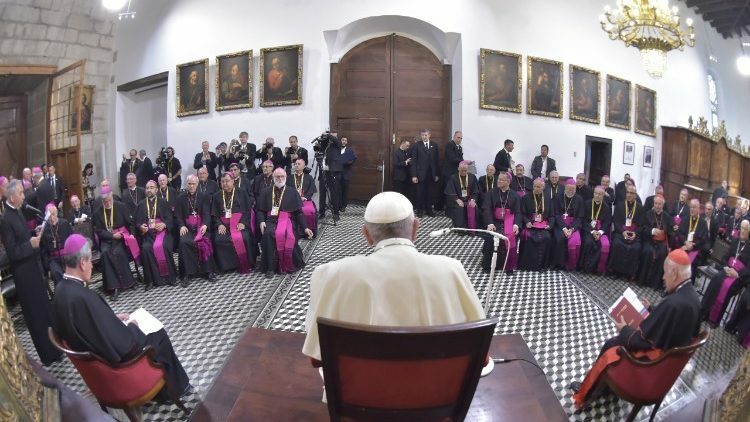 The Holy Father thanks his brother Bishops for their willingness to stand in docile and humble listening to the Holy Spirit, and he renews his request to the People of God in Chile to continue to pray for the conversion of all". The communiqué concluded by confirming that the Pope will not be issuing any statements, either during or after the meetings, “which will take place in absolute confidentiality".